WASHINGTON (Oct. 15, 2008) -- The testing of Future Combat Systems equipment and testimonials from Soldiers using it may have helped the program receive full funding for the first time. President George W. Bush signed the National Defense Authorization Act for Fiscal Year 2009 Oct. 12. The new bill includes some $3.6 billion in funding for FCS, the full amount asked for by the Army. This is the first time Congress has fully funded the Army's FCS request. 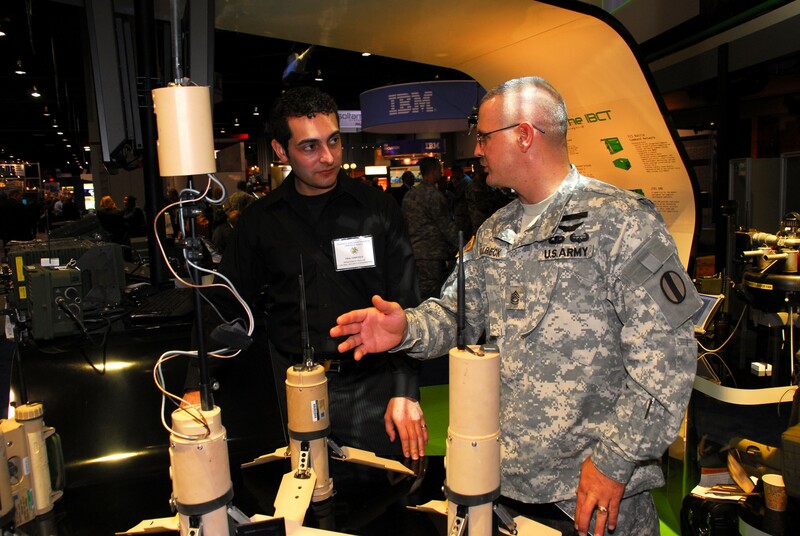 Paul Cianciolo, an analyst with L-3 Global Security and Engineering and a major in the Washington D.C. Civil Air Patrol, learns about Tactical Unmanned Ground Sensors from SFC Kenneth Kolbeck, a Training and Doctrine Command capabilities manager for Future Combat Systems. The TUGS were on display during the 2008 Association of the United States Army Annual Meeting and Exposition, Oct. 6-8 in Washington, D.C.
"I think it's very notable we received full funding," said Lt. Gen. Stephen M. Speakes, deputy chief of staff for G-8, during a conference here Oct. 8. "And we think it's a factor that we have capabilities in the hands of Soldiers ... where our critics and supporters alike can talk to the Soldier who is a combat-hardened veteran, (and) who does have a unique perspective about what their needs were that were unmet when they were last in combat." Speakes said moving away from presentations and slideshows and allowing both FCS supporters and detractors to see the Spin Out-1 equipment in the hands of Soldiers has allowed everybody to get a more realistic view of what FCS is about. It "has had a powerful affirmative affect in instilling confidence that the Army has it right, with delivery capability on time and on target," Speakes said. "And this (is) absolutely essential to the needs of the Army today and tomorrow that we continue to support this program." Though there is no FCS equipment currently in either Iraq or Afghanistan, there is "surrogate" equipment there -- about 25 Micro Air Vehicles in the hands of the 25th Infantry Division and also about 1,500 Pacbot robots. The MAV is similar in appearance to the FCS's Class 1, Block 20 unmanned aerial vehicle. And though it lacks some of the communications capability the FCS UAV will have, it was developed from FCS technology, officials point out. The Pacbot is similar to the FCS unmanned ground vehicle, though it is heavier and lacks the ability to communicate with the FCS network. It too was developed from FCS technology. Pvt. Michael Hartz, a member of the 3rd U.S. Infantry at Fort Myer, Va., learns about the Micro Air Vehicle from Dan Fouts, of Honeywell, during the 2008 Association of the United States Army Annual Meeting and Exposition, Oct. 6-8 in Washington, D.C. The MAV is one of the "surrogate" technologies currently in Iraq. The MAV is strikingly similar in appearance to the Future Combat System's Class 1, Block 20 unmanned aerial vehicle. Though the MAV lacks some of the communications capability the FCS UAV will have, it was developed from FCS technology. 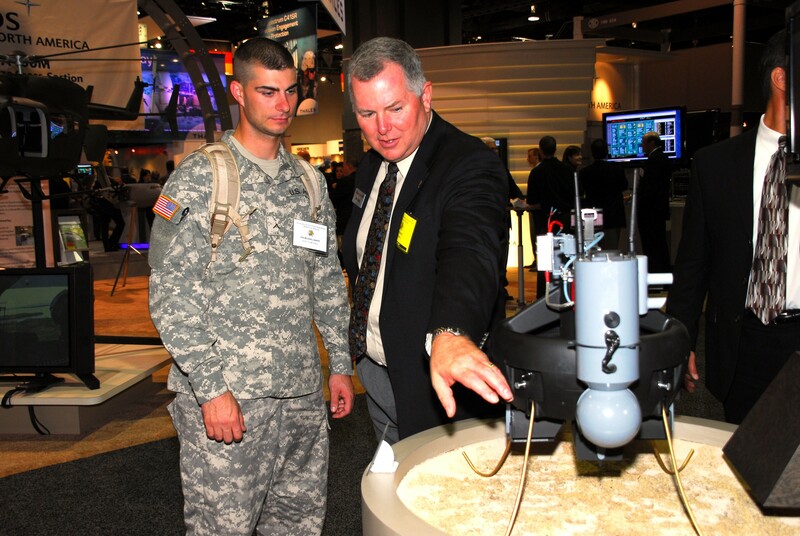 Actual FCS technology is now in the hands of Soldiers at the Army Evaluation Task Force at Fort Bliss, Texas. Equipment there includes the actual Class 1, Block 0 UAV, the SUGV, the Non-Line of Sight Launch System and kits to network Humvees to the FCS network. While not part of FCS, but instead a complimentary system, the Ground Soldier ensemble, from PEO Soldier, is also at the AETF. The ensemble will eventually hook Soldiers into the FCS network -- making Soldiers themselves a future combat system. Soldiers at the AETF have already conducted testing on FCS equipment while acting as a heavy brigade combat team. Now they are resetting to test as an infantry unit. That testing leads up to "limited user testing" in summer 2009. The LUT is the brigade-size test that will prove usability of the equipment and pave the way to the "milestone C" decision which officials say will allow the program to move toward production of equipment for fielding in 2011 with infantry brigades. "That will eventually lead to the production testing in 2011 that goes to the first Infantry Brigade Combat Team," said FCS Program Manager Maj. Gen. Charles Cartwright. "Once that IBCT is done, we will ramp up to about four IBCTs, both active and Guard, across the Army to finish out all the IBCTs." Eventually, as many as 43 IBCTs across the Army and National Guard will be equipped with the FCS components included in "Spin Out 1" of FCS -- the equipment currently in testing at AETF. By 2015, officials expect the first FCS Brigade Combat Team to be equipped with the full slate of FCS equipment, including its manned and unmanned vehicles, its UAVs, and its network. Until that time, additional components will be pushed out to the force, including such things as Multifunctional Utility/Logistics and Equipment, known as MULE, and the Class IV UAV.